Gosh, these Thursdays are rolling around super quickly aren’t they? Every Thursday I upload a video to my Youtube Channel and this week it is my Christmas Gift Guide. You might have noticed a few different gift guides that I have uploaded onto my blog already, along with a great Christmas shopping guide to make your Christmas easier by helping you to pick out the best beauty gifts for the ladies in your life. 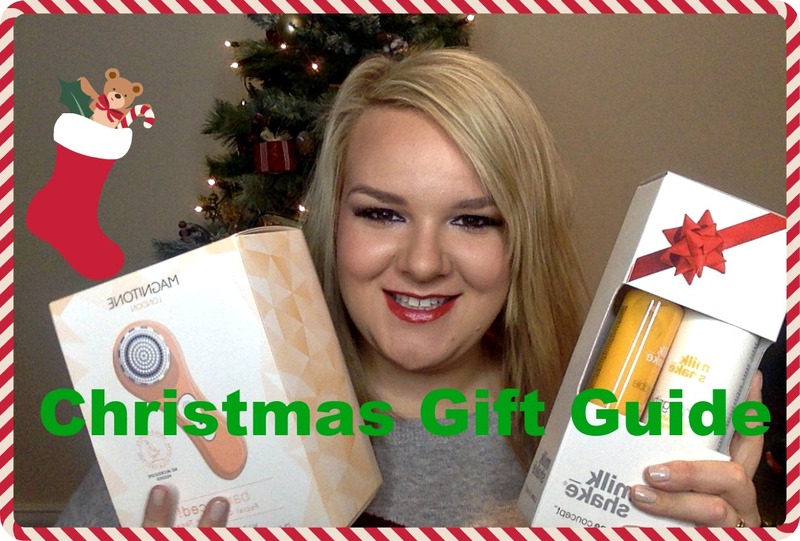 To coincide with my Christmas Gift Guide video, I am going to be uploading a series of gift guide posts, categorising the presents into Under £10 aimed at stocking fillers and small gifts for friends, Under £50 and Over £50, which are more designed as main presents, as well as a Christmas Gifts for Men post. Not only will they feature the gifts from my video but plenty more so that you will have lots of ideas as to what to buy someone in your life for Christmas. I’m sure I don’t need to remind you all though that there are lots of people who are worse off than you and I this Christmas. Even just being able to read this post on a screen makes us far wealthier than many people in the world. Last year, I put together a video of some of the different ways that you can give back at Christmas which you can view here and it gives lots of tips and ways that you can donate your time, items and money to worthy causes and people in need. This post is the first in my bumper gift guides, focusing on presents that are under £10. I’m a big believer that you don’t have to spend a lot of money in order to get someone a really nice gift and these presents certainly prove that. First up is a present from the Sanctuary Spa and its called their Little Tin of Treats. 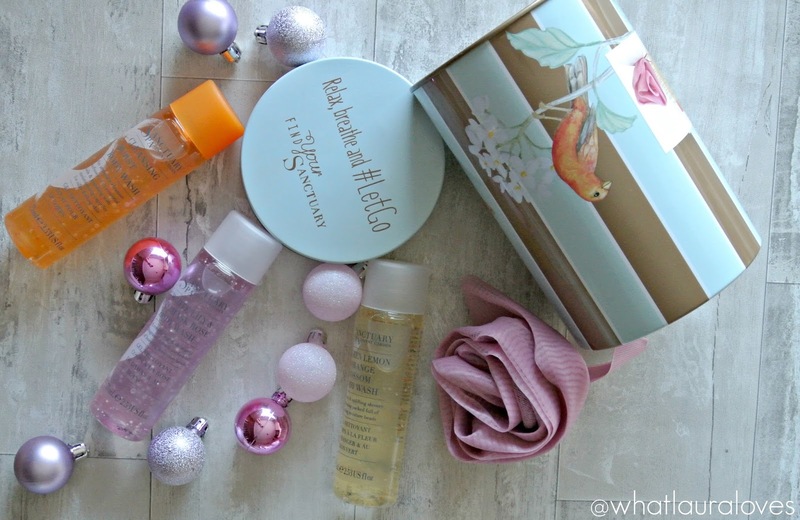 This has three body washes, including one that has their signature scent and a shower lily, houses in a gorgeous vintage inspired tin that could be used after Christmas to store lots of little bits and pieces in. I love the Sanctuary Spa and Christmas wouldn’t be complete without one of their presents. As a brand, they remind me of my mam as she has often bought me their products for Christmas and I’ve never had a product from them that I have hated so they’re very much a fail safe option when gift giving. I really think that they’re a brand that transcend generations as my Nana and Mam love their products too. While they’re high performing, they also smell incredible and look really pretty so its a win win. They have so many gift sets which are all available here. Another low cost bathing gift has to be the Dirty Works Bath Indulgence kit which is a pamper lovers dream that is also very friendly on your purse strings. The packaging is superb, very quirky and fun and you get a great selection of products inside which makes this gift look a lot more expensive than it is. I’ve used plenty of their products in the past and can assure you that they work really nicely and smell great too. Inside, you get the Lie Back and Relax Satin Eye Mask, Big Chill Out Bath Soak, Bye Bye Day Body Butter Light, Shea You Care Body Butter, Buff Your Stuff Body Scrub and the Coconut Cream Lip Balm. This would make a great gift for any woman that likes to pamper herself and try out lots of different products. For those of legal age, you could even give this gift with a nice bottle of wine or a candle to really complete the pampering experience! This year, tanning legends St Tropez have released two crackers that would make great stocking fillers, secret santa gifts or even elaborate tree or table decorations for beauty lovers. The first is the St Tropez Instant Cracker which is the cheaper of the two at £5. This one contains a tube of their lotion that provides an instant tan on the skin which makes it ideal for those who like to go on party nights out as they can apply it for that night and then wash it off the next day in the shower with some body wash and warm water. 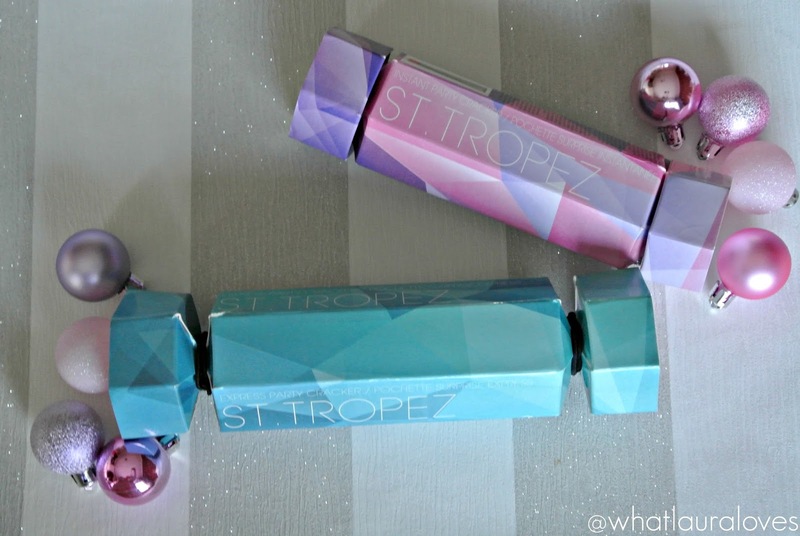 The second is the St Tropez Express Party Cracker which is the more expensive option of the two but still affordable at £10. This crack contains a small bottle of the St Tropez Express 1 hour tan and a tanning mitt to apply it. I’ve used this tan in the past and the great thing about it is that you can adjust the length of time that you leave it on to alter the depth of the tan that you get. If you leave it on for 1 hour, you get a light, golden glow, 2 hours is a mid tan and 3 hours plus is a dark tan. It is a mousse formula so it doesn’t feel drying on the skin and it is comfortable to wear until you wash it off. The great thing about this tan is that you don’t have to wear it over night so if you go on any last minute nights out, you can apply this during the day, wash it off and you’ll get a lovely golden tan just as you would have done if you’d left it on over night. This cracker is perfect for anyone who likes to false tan. St Tropez are well known as tanning experts and they’ve developed a formula that gives a natural, golden glow so even those with the palest of skin tones will be able to use this and enjoy the results. Another low cost present that I think would make a great stocking filler or secret santa gift is the Senspa Relaxing Mini Treats gift set which you can pick up with your shopping at Waitrose. It comes with a SenSpa Body Puff, 50ml SenSpa Relaxing Body Wash and a 50ml Relaxing Body Butter which smell incredible; very relaxing and they almost make you feel sleepy. The scent of this line combines organic lavender, starflower and jasmine extract, bergamot, patchouli and geranium essential oils. It is an ideal gift for someone who likes a little bit of a pamper but with minimal products and the relaxing scent of these products makes them ideal for busy mums or those who like to take a nice bath after a long day at work. Since they’re travel sized, if someone you know works away from home, it would suit them even more! Next up is an ideal gift for any fashionista who likes to wear accessories. 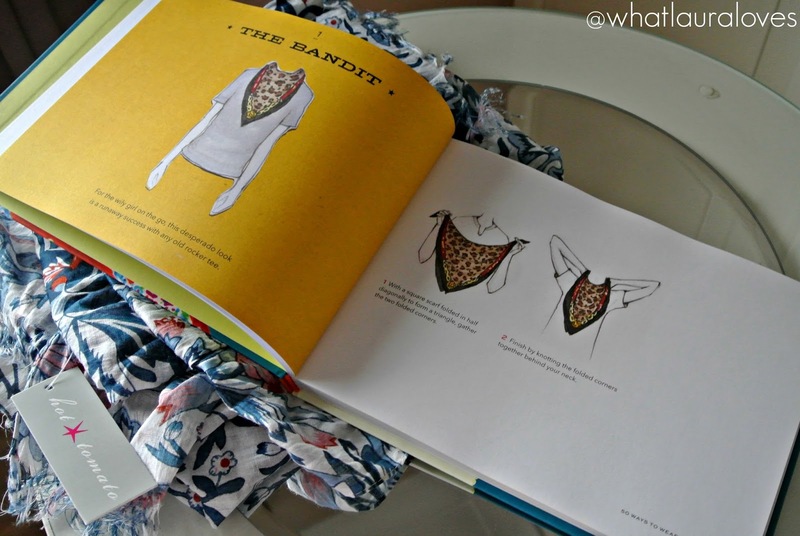 The 50 Ways to Wear a Scarf book is ideal for those who like scarves, whether oblong or square ones and it is definitely appropriate for this time of the year when it is absolutely freezing outside. 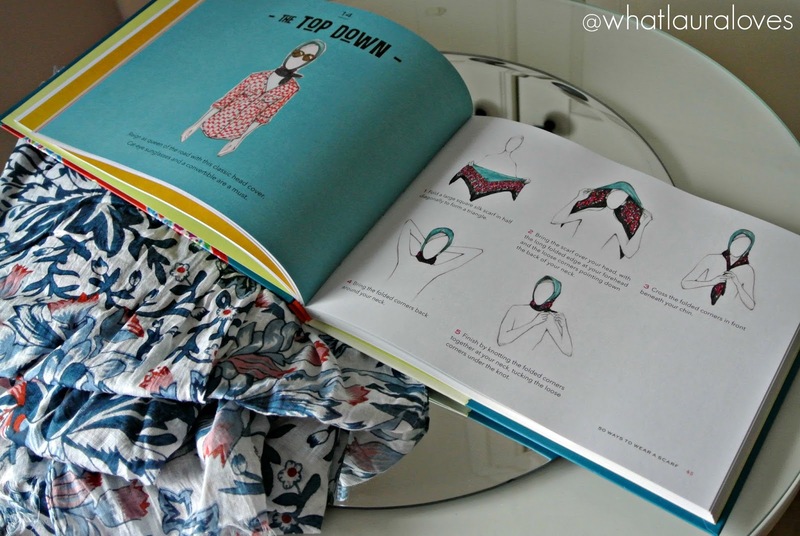 This book is great because it features looks that you can create with thick woollen scarves or finer ones so it is something that she will be able to get use out of all year round. 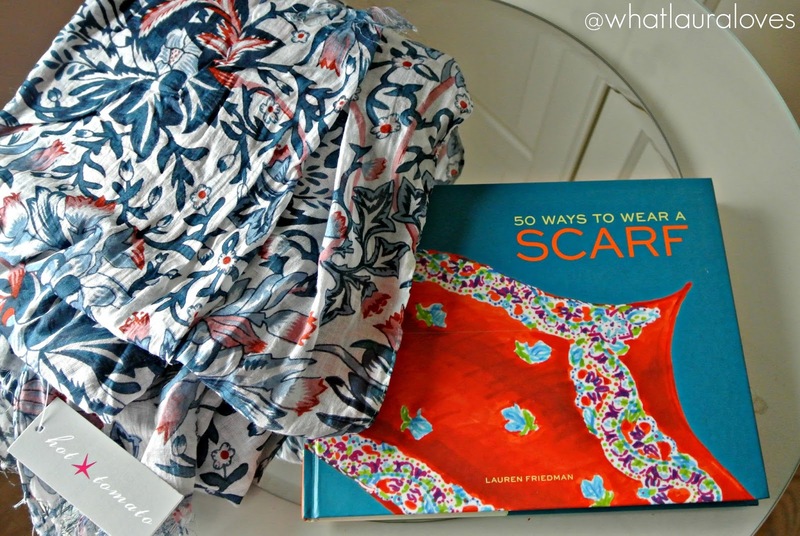 This is a great book to flip through when you’re looking for a different style as even tying a scarf in a different way can really change the look of your whole outfit. I was pleased to see that there are plenty of looks inside this book that would be suited to men as well as women. The step-by-step guide is accompanied by beautiful, fun illustrations which make the steps straight forward to follow and the looks easy to recreate. This book comes in right at the end of the under £10 budget but if you had a little more to spend you could always accompany the book with a gorgeous scarf. Some of the ones that I’m currently lusting after are here. If you’re looking for something a little more unique this Christmas, then I’d suggest looking at small boutique style shops that offer handmade goods. That way, not only are you helping to support small businesses but you’re buying something that is harder to come by so the chances are, no one else will have bought your loved one the same thing. On such shop is Cute As A Button which is an online handmade jewellery store. They make lots of beautiful pieces that I’m sure lots of girls would love to receive and they’re all really affordably price. For those who love to add a little Christmas sparkle to their outfits at this time of the year, the Snowflake Earrings and Reindeer Earrings are absolutely perfect. When I worked in an office, we’d often go in wearing fancy dress or Christmas inspired pieces so if you work in an office doing a secret santa then I think either of these would be a perfect piece. I can see any lady loving wearing them on Christmas day too so they’d make a great stocking filler! Cute As A Button also make some gorgeous bracelets too. If you’re looking for a stretchy piece, the Princess Bracelet is ideal as it is generously sized and will stretch to fit over your hand onto your wrist. It features light pink, pearlised beads with one silver coloured charm bead that has a pattern engraved into it. Perfect for girlie girls. For those that like to party, I think the Diamante Classic Elegance Bracelet is ideal because it comes in a beautiful purple jewel tone that would compliment so many stunning Christmas party outfits. The beads are also available in ivory which would again compliment so many outfits this winter and could be worn all throughout the year as it would make a great occasion piece, especially for a wedding. It comes on a wire so the bracelet is more rigid, a bit like a bangle and the beads have sparkly diamantes in between them. The last piece is one that I think would be ideal as a gift for a girlfriend or wife. The I Love You Bracelet is a really versatile piece that would suit so many people. It has beautiful stainless steel ball beads, glass pearl beads and Tibetan Charm beads on it along with a little ‘I Love You’ charm that clips on and off. I’m sure that the person you love would love to find one of these in their stocking this Christmas! You can find Cute As A Button on Facebook, Twitter and Instagram. 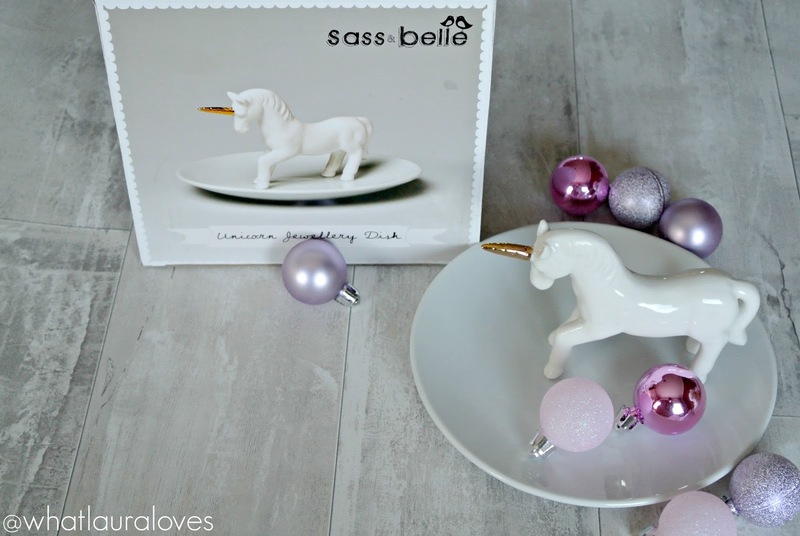 My final Christmas gift suggestion that I have here to show you is the Sass and Belle Unicorn Jewellery Dish which is available from Flamingo Gifts. Jewellery dishes and holders have really made a comeback over the last year and Flamingo Gifts definitely have some of the best stock around. I love the simplicity of this piece and the use of the gold as detailing on the unicorn’s horn. White and gold look so chic together and will go with everything so regardless of the colour scheme in their room, this piece should fit in perfectly. It is a great catch all item that can be used to store everyday, dainty items of jewellery on the dish part and on the unicorn itself and when not in use in this way, it makes a lovely ornament too. Flamingo Gifts are offering readers of my blog 15% off when they enter code LAURALOVES at the checkout. I’ve linked plenty more stocking filler and secret santa gifts for women below and they’re all under £10. I’ll have more posts in the coming days with even more gift ideas for you all. In the meantime, I’d love it if you could head over to my youtube video and give it a thumbs up. What stocking fillers are you hoping to give or receive this Christmas? What a lovely selection, and given me some great ideas I am loving all these christmas guides as finding them so helpful this year. You are right there are people who have nothing and we must be grateful for what we have got. Thank you for putting things into perspective and love the Sanctuary set. Yes to it all!!! I would be so thrilled to get all of these as a stocking filler! OMG that unicorn! I wnat it now badly! I want the unicorn!!! Fab pictures! I off to read the rest and watch the vlogs!